Dealing with electrical issues is no fun! But, how exactly do you know if you’re having an electrical issue? There are a few tell-tale signs that show that you’re having an electrical issue. The signs below can assist you in preventing a major electrical problem in your home. The smell of electrical burning is a very particular smell. The smell is not quite like a regular burning smell (like the smell of a fireplace or outdoor bonfire). If you smell something that’s similar to the smell of plastic burning in your home, it may be an indicator of an electrical problem and should be addressed immediately. If you happen to touch one of your outlets and notice that it is hot, this is an indicator of an electrical problem. Your outlet may become warm from the electric current but should never be hot. If the lights in your home are flickering or dimming, there may be a problem that needs to be addressed. Typically, flickering and dimming lights are caused by the excess draw of energy by appliances that need more electrical power (like a dishwasher or washing machine). This problem may require the installation of a dedicated electrical line for the appliances that need more power. For the best answer for your specific home, consider consulting an electrician. When your electricity is working properly, it shouldn’t make a noise at all. Thus, if you happen to hear a buzzing sound, this is a sign that something isn’t quite right in your electrical system. Your GCFI outlets are equipped with a “Test” mode that allow you to check and see if the outlet is functioning properly. When put in Test mode, the outlet should not work and should begin working again when you hit “Reset.” If this does not happen, you have a problem that should probably be checked out. A breaker tripping every once in a while is common and is typically not cause for concern. However, if your breakers are tripping frequently, it is probably time to call in an expert because that can be a sign that your system is overloaded. Sparks are never a good sign when it comes to your electrical system. If you ever see sparking, you’ll need to call an electrician immediately. If you noticed frayed, improperly spliced, or otherwise damaged wiring in your electrical system, there is a problem. This is incredibly dangerous as it is a fire hazard and should be addressed immediately. Aluminum wiring is a huge problem that needs to be addressed because it can be a fire hazard. This type of wiring most frequently occurs in older homes that had the electrical system installed before the hazard was realized. If your home has aluminum wiring, you will likely want to get it replaced as soon as possible with the much better copper option. So, what happens when you see one or more of these signs of an electrical issue? 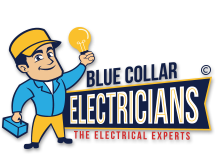 You should call trained electricians, like us at Blue Collar Electricians, who provide issue diagnosis services. We’ll come in and figure out the root of the problem depending on the symptoms, let you know how best to fix it, and then offer our services to get your electrical system back in top shape. Recognize one of these problems in your home already? Let’s talk today!